While in Barcelona we stayed at the Hotel Peninsular, a typical one-star hotel just off the main drag of Las Ramblas. It offered all the mod-cons of a classic one-star hotel - sparse rooms, thin walls, a cornflakes continental breakfast - but the interior was highly unique. The building was originally a convent of the Augustine Order, and the rooms were previously monks' cells. 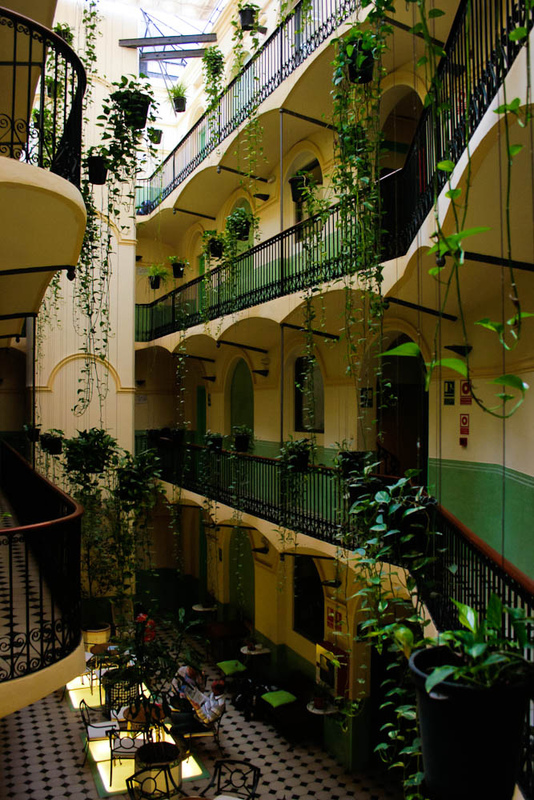 All open out into the rather fantastical interior courtyard, with hanging plants, tiled floors, and wrought iron balconies running around each level. One afternoon, after a morning of wearying but fulfilling touristing, we sat in the empty courtyard drinking a couple of Barcelonan beers, soaking up the peacefulness and planning our next attack on the city. Staying in a place like this is what I search for in every trip that I make - I want to stay somewhere so completely remarkable that it reiterates the fact I am in a different country, experiencing different things. 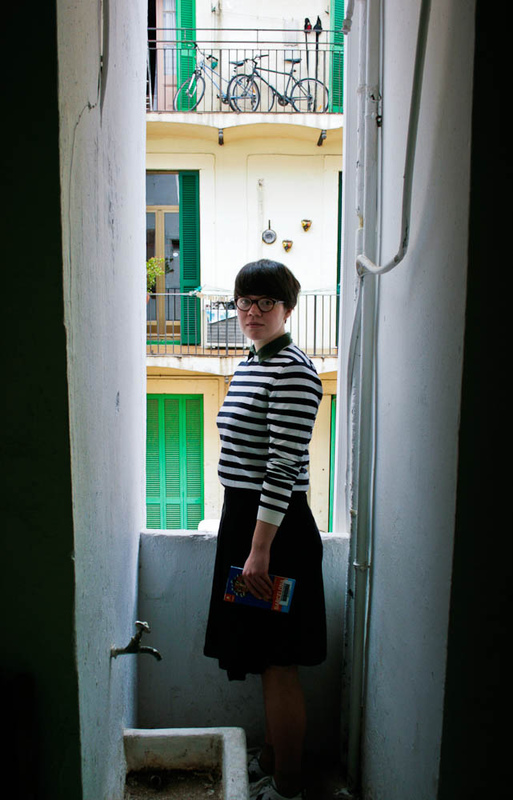 In the photo above I am standing in a small alcove next door to our room, ready for my first day of exploring, Barcelona guidebook loaned out from the library (overdue) in my hand. These photos are the first batch Kris has sorted through from his digital camera. I am still waiting for the pictures off the roll of film I took. I was rather restrained with camera usage, not wanting a lens to continuously be obstructing my impressions and views of places. I tell myself I didn't come all the way to a foreign city just to photograph it. Some things have to be experienced first hand.